We know GPS and maps can be a bit confusing. So we put together a quick guide to a few technical terms used in ViewRanger. 1. 3D Flyovers: a 3D map feature in ViewRanger that overlays routes and tracks onto 3D maps. 2. AR: short for augmented reality. Technology that superimposes digital information onto the real world around you. 3. BuddyBeacon: a live-tracking feature in ViewRanger that allows users to privately share their location with other people. 4. GPX: a file format to exchange GPS data between mapping software, navigation apps, and GPS devices. GPX files can be imported and exported from ViewRanger. 5. Map tile: a small image file of a map. Every location is divided into hundreds, if not thousands, of map tile images at different zoom levels within ViewRanger for faster download times. 6. POI: short for Point(s) of Interest. A standalone point that can be privately marked in the ViewRanger app. It includes GPS coordinates and optional notes the user wishes to add. 7. Route: a pre-planned guide you download and follow in ViewRanger. Typically routes are posted by publishers and writers but also can be created by any ViewRanger user. Routes can contain lots of information, including GPS data (tracks and waypoints) photos, guidebook-style directions, and user reviews. 8. Skyline: an augmented reality feature in ViewRanger that uses the camera on a smartphone or tablet to label peaks, places, and other points on the real landscape. Also shows navigation arrows and waypoints when following a route. 10. 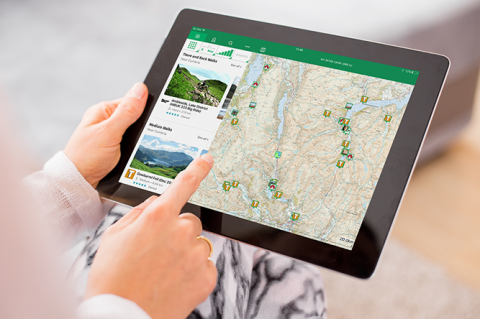 ViewRanger Credits: a way to buy a la carte maps and paid-for routes in the ViewRanger app. 11. Waypoint: a GPS location found along a route with extra navigation details and/or content. We hope this helps you understand some of the jargon used in ViewRanger. Got any other jargon questions? Post them in the comments area.